You can get 20% off all make up at The Body Shop today, so if you’re looking to update your make up bag for the summer, today’s the perfect day to do it. The Body Shop’s Summer collection has some striking shades for summer, including complementing blue and purple eyeshadows and eyeliners. There’s also everything you need to create that perfect summer glow – from bronzing powders to Sheer Sun Gel, and if you want just a hint of shimmer, try Brilliance Powder – a brush and powder applicator all in one that allows you to get just a hint of sparkling pearls where you want it, with a shimmer or matte finish. The offer also includes all the tools you need to apply your make up – brushes, sponges, eyelash curlers, and even tweezers. 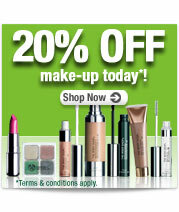 So head over the The Body Shop website now and pick up some bargains!